Bluebird Gardens suggestions for Missouri summer gardening. Years ago, I first saw Blue-eyed Grass by the side of my gravel country road. Thinking I needed new glasses, I went back a few days later trying to find the lovely blue flowers, only to come across clumps of what looked like grass. Once I identified the flower in my Missouri Wildflowers book and understood it was actually a tiny iris, it was much easier to spot them. The pointed ends of Blue-eyed Grass is one giveaway to this Missouri wildflower; another are the small green seed balls that form after the flowers are finished blooming. These perennial Missouri wildflowers are tiny; here the plants are up against wild strawberry plants, themselves smaller than regular strawberry plants. 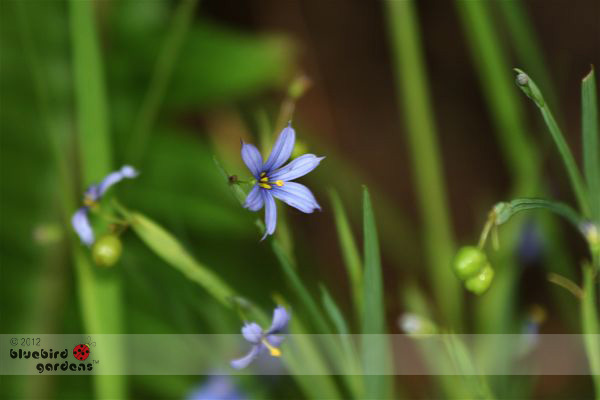 Blue-eyed Grass starts blooming mid April and will continue through summer. I planted the latest patch next to my Hydrangea tree, and impatiens in a fallen pot, outside my front door. This way I can enjoy them every time I go outside.